Apple cider vinegar is generally regarded as a very useful substance especially in human health because of the many benefits that it provides. Aside from its antibacterial properties and immune system-boosting capabilities, apple cider vinegar or ACV is also highly regarded in its role in detoxification and cholesterol reduction. But do these benefits naturally extend to man’s best friend? Unfortunately, there is a dearth of clinical evidence empirically proving the clinical effectiveness of ACV on dogs. This doesn’t mean though that apple cider vinegar doesn’t extend the same benefits to pooches. It has not been studied yet. But with many anecdotes saying it works, we’re more than inclined to share with you the following benefits of apple cider vinegar for dogs based on the experiences of countless pet owners and veterinarians alike. One of the most common uses and, thus benefits, of apple cider vinegar is in the management of skin itching especially that which is attributed to yeast infections and poison ivy toxicity. Veterinarians say that yeast is not particularly adaptable to the acid environment that is created by apple cider vinegar. As such it is actually recommended that a quarter to half a teaspoon of ACV be given to your pooch two times a day. For the topical application of apple cider vinegar on itchy parts of your dog’s skin, experts actually recommend making a 50-50 solution of ACV and water and then spraying the solution over the affected area. However, caution should be observed not to spray the solution on open wounds or breaks in the skin as doing so can be quite painful for the dog. Another way in which ACV can be used to help relive itching is by rinsing your pooch in an ACV solution composed of a quart of water and 3 tablespoons of ACV. The solution is applied onto the dog’s coat right after regular bathing. The solutions should not be rinsed off. Instead towel drying is highly recommended to remove the excess moisture before allowing the dog’s coat to dry naturally. There is this really peculiar ability of apple cider vinegar to create an acidic environment that is definitely not friendly to yeast organisms. 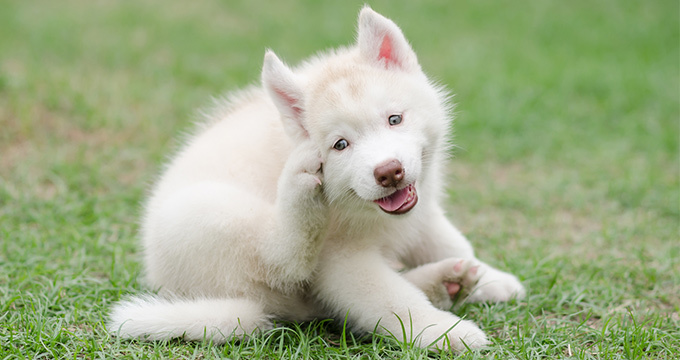 And since one of the most common reasons why dogs can have itchy ears is because of a yeast infection, the use of apple cider vinegar can greatly help in both the cleaning of the ears and the treating of the yeast-related ear infection. This is one of the most commonly reported benefits of apple cider vinegar on dogs. Fleas and ticks are two of the most annoying pests ever to infest man’s best friend. 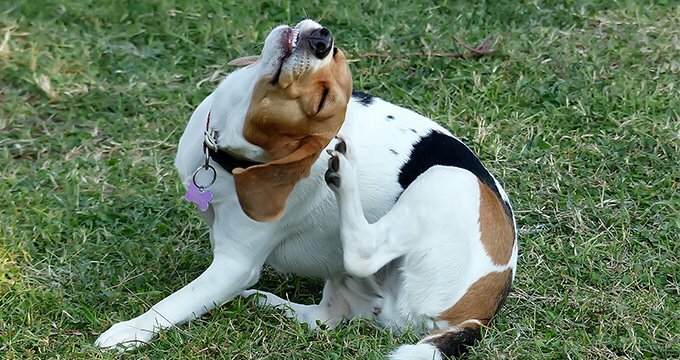 Fleas may not cause deadly diseases but they cause flea bite dermatitis among susceptible dogs as well as have the tendency to deliver intestinal parasites if they are ingested. Ticks, on the other hand, bring a lot of tick-borne diseases that affect not only dogs but humans as well. While it is not exactly known how apple cider vinegar can repel these ectoparasites, it is believed that it has something to do with the acidic environment that ACV creates. As a flea and tick repellent, ACV can be used as a sponge bath, a spray, or even by mixing with your dog’s food. If you wish to use it as a sponge bath, you’ll need equal parts of ACV and water and dunk a large sponge into the mixture. Use the soaked-up sponge and rub it on the body of your pooch. Be sure to do this right after your dog has taken a bath while its coat is still wet. If you wish to use ACV as a spray-on flea and tick repellent, you can use the same formulation of equal parts water and ACV and putting it into a spray bottle. Before letting your dog outside your home, spray the water-ACV solution onto its coat, being extra-careful not to spray into the eyes or nose of your dog. If you want to add ACV to your dog’s food as part of its flea and tick repellent regimen, you can add anywhere between a teaspoon and a tablespoon of ACV for every 50 pounds of your pooch’s weight. Make sure to mix the ACV well into your pet’s food or water. It is imperative to understand the implication of a flea and tick repellent. Apple cider vinegar will not kill fleas and ticks. It only makes the dog’s skin and coat less bearable for these organisms to thrive. That means that fleas and ticks are still essentially in your surroundings, just waiting for the flea and tick repellent effects of ACV to wear off. Then, they can easily crawl or jump onto your pet again. A lot of pet owners attest to the effectiveness of ACV in the management of hot spots in dogs. The formulation for such a solution is equal parts of water and ACV. The solution is then dabbed or sponged onto the hot spot. This can be repeated every day until such time that the affected area is beginning to show improvement. There are other benefits of apple cider vinegar for dogs. However, we can only share with you those benefits that have been observed and reported by a greater number of dog owners. 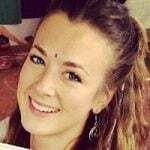 At the very least, we can say that these benefits are proven, albeit anecdotally.